Texans want limited government, their wishes should be fulfilled in West. Here in San Diego we are certainly no strangers to natural catastrophes on a massive scale. Those of us who have lived here for any significant length of time certainly vividly recall the wildfires of 2003 and again in 2007. While I was not personally directly affected by either of the two fires, I had someone fairly close to me who was, and everyone I knew who cared about him and his family shared in the family’s tragedy and anguish—they lost everything in the 2003 Cedar fire. It was a long process of recovery, but they got through it with a lot of help and support. So it is not out of a complete lack of knowledge and sympathy that I comment on the events in West, Texas last week. That’s right: There was another “major” event last week, although one can be forgiven if they are left unaware of it. Events in another part of the country kept us pretty well preoccupied. But now that the situation in Boston has more or less come to a head, our attention now turns to the central Texas town of West, where an explosion at a fertilizer factory killed 35-40 people and destroyed a significant portion of the town, including a nearby school and an apartment building. I use quotation marks around the word major above, however, because I’m not sure how much heed we should pay to this otherwise mundane Texas locale. This was a significant event to be sure, and the people of West are fortunate that only 35-40 people are dead. Without a doubt it could have been far, far worse. But should this be a story of national import? Should the events in West, Texas, be treated with the same gravity of the San Diego wildfires, Hurricane Katrina, or the tornadoes in Joplin, Missouri? I would argue certainly not. Understand something about Texas: It is a deeply red state; overwhelmingly Republican. Secessionist fervor runs rampant in that state, including by their governor. Texas is all about limited government, and according to their elected representatives, they want the federal government to stay out of their business. The politics of Texas would appear from the outside looking in to be in favor of confederation form of central government, where state law trumps federal law—exactly the form of government ultimately rejected by the Founders. States’ rights is the rallying cry, but states’ rights also means states’ responsibility. Limited government means limited regulation. Emerging details of the events in West tell us that this was an entirely preventable tragedy, but the preference against regulation or oversight virtually guaranteed that something like this would eventually happen. In fact it has happened in Texas, repeatedly with several massive oil refinery explosions in the state in recent years. But safety regulations are mostly ignored in favor of letting the “job creators” create jobs in their own, unfettered way. Profitability trumps public safety. The explosion in West was ultimately caused by a failure of oversight in deference to private industry. This was a private company acting irresponsibly, not a natural disaster. 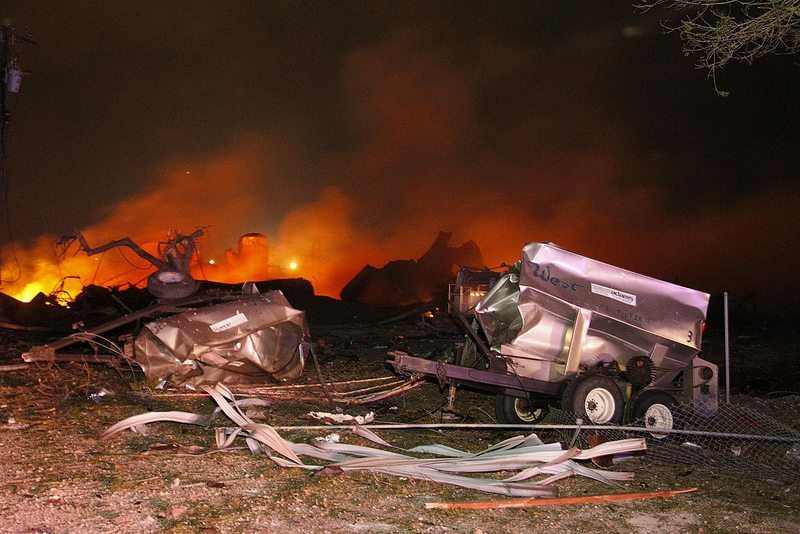 The explosion was caused by an excessive amount of ammonium nitrate on the site. Ammonium nitrate is a primary component of some large bombs used by terrorists, including the bomb used by Timothy McVeigh to blow up the federal building in Oklahoma City. The plant also reportedly had no automatic shutoff system, no firewall, and no sprinkler system. Safety for the workers and the surrounding community was obviously not any kind of priority. It stands to reason, then, that the owners of the private West Fertilizer Company should be held responsible for the damage they caused, not the taxpayers. After all, that’s what the Conservatives in Texas want—for business to be able to do what business does best. That also means, however, being held entirely accountable when they screw up, which is not something Conservatives have been very good at. Apparently it’s not in the Republican lexicon. Also consider this: Texas representatives to the federal government by and large voted against providing relief to the New York and New Jersey victims of Hurricane Sandy. That was a natural disaster caused through no fault of anyone, and yet the conservative lawmakers of Texas determined that providing aid in that instance would be a waste of taxpayer money. Both Texas Senators Ted Cruz and John Cornyn, along with seven Republican members of the state’s Congressional delegation voted against Sandy relief. Cruz is now demanding federal assistance in the recovery efforts in the aftermath of the West explosion. Ordinarily it would be cruel to suggest that innocent bystanders be denied government assistance in a time of need. In this case, however, I find it difficult to muster up any sympathy for the victims in West. This, after all, is the government they wanted. This is the government they voted for. They selected representatives who believe that when a less conservative region of the United States requires help, it is a waste of money to provide that help. Why, then, should West, Texas—or anywhere else in the Southern United States, for that matter—be treated any differently by their own representatives? Why should we allow it to be treated differently? As I said, states’ rights by definition also means states’ responsibility. Elections have consequences, and the people of Texas have chosen the direction they want their government to sail. Through their elected representatives the people of Texas refused to help their neighbors to the north. Why should they now expect assistance in recovering from an entirely man made and preventable event? This would seem to be the perfect opportunity to allow Texas Conservatives to demonstrate just exactly how superior their preferred form of government is. In Texas, lax regulation is the rule. Ignoring federal regulations—as the owners of the West plant so clearly did—is considered almost patriotic. Give them what they want. Allow them to prove how well their form of limited government works without interference from the outside. You know, freedom and liberty and all that. Who are we to “interfere” with federal government assistance? Allow them to demonstrate to the rest of us how this situation should be handled. In California we chose a different path, and although SDG&E has not been held nearly accountable enough for the disaster in 2007, unlike many in Texas we expect our government to step in with aid to those in need. Andy- I know you well enough to understand that your critique of Texas’ conservative/libertarian bent does not imply a lack of empathy for the real victims in this situation- volunteer firefighters who lost their lives; people who lost homes and housing constructed without any sane zoning regulations that would otherwise require a safe distance from the plant; and a community’s school. Ordinary people, who are just trying to keep their lives together, pay the price for all that freedom lovin’ rhetoric (and financial gain by a view). If Rick Perry continues his efforts to woo businesses to Texas, the American public should have a much better idea about what that might actually entail. From my perspective, we can’t get federal disaster relief to the people of West fast enough. And the owner of the plant should not be able to collect insurance and get on with his life as if nothing happened. I understand perfectly that many people in West will suffer, but there must be consequences for choices made, or bad choices will continue to be made and people will never learn from said mistakes. Poor choices, in other words, should not be rewarded in my perhaps not so humble opinion. I’m on the fence with this. You have a very valid point and there’s certainly some satisfaction I get from the fact that many will now have to eat their own words, but still suffering is suffering. Despite Texas being overwhelmingly Republican, that still doesn’t mean everyone there is a Republican (I know plenty who are not) or even those who are support 100% free market no if ands or buts consequences be dammed. The other thing to consider is there are children (who didn’t vote and cant yet) who lost a parent, wives and husbands who lost a spouse and may now suffer financially. Sometimes you’ve got to be willing to help even those who would gladly push you off the cliff. Conservatives cry the loudest when their ox is gored. When it’s someone else’s ox, they’re not in favor of helping out. I’m with Andy. They should get a taste of their own medicine and not come crying to the Federal government when they need help all the while denying help to anyone other than themselves. Give them a taste of their own medicine. You have guts, Andy. I’m with you the whole way. Is there no “OSHA” in Texas. What the owner did was against the law. Why should we, the taxpayers, bail him out? Unfortunately it’s not a matter of bailing the owner out, it’s more a matter of bailing the victims of his malfeasance out. But then the question becomes, why should the taxpayers pay for his blatant disregard for the health and safety of the workers and residents of West? And why should the rest of the country pay for Texas’ complicity in that malfeasance? This is a Texas problem, and Texas should deal with it. Either that or admit that they’re wrong and make the necessary changes. But we all know that will never happen. It really goes against my grain not to help but I agree with you 100 per cent. There’s a certain arrogance about Texans; they want to have it both ways. Politicians like Cruz, Cornyn and their dipshit governor help to make them beyond the pale which is where they really want to be. Except that not all Texans think that way despite what any statistics say. a story of national import,” and in the next breath say it shouldn’t be. sake, not for political gain. Maybe the Justice Department should sue the owners of the fertilizer plant, who after all were grossly negligent, and use that money to aid the victims rather than taxpayer money. I don’t think taxpayers should be on the hook for every corporate malfeasance, but the victims should definitely be compensated. One victim has already sued Adair Grain. More definitely should. Hypocrite Rick Perry wants the “gubment” to pony up the money so that the corporate interest doesn’t have to. We shouldn’t be suckered into going along with his game out of sympathy for the victims. After all he won’t support the victims of the next weather related tragedy outside his state. Sure, but that’ll take years, and I’m sure that the owners of the plant lack the resources to cover the bills. They’ll simply declare bankruptcy and get on with their lives. Perhaps one solution would be to require insurance, and then hold the insurance companies responsible for paying the bills that come due after such an event? It would then be in the insurance companies’ best interests to ensure that their client is in full compliance with regulations before they’ll agree to continue to cover the business. And without proper insurance coverage, the business would be forced to shut down until such time as they do acquire adequate coverage. I can see the desire to take gleeful pleasure in watching Texas hoist with their own petard, but in the end, I have to agree with bob. Two wrongs don’t make a right and your premise would be a variation on capital punishment with the wrong person being hanged. “Why do we kill people to show people that killing people is wrong?” still applies here. Why not take the high road and use it as a teaching moment? Make the politicians sweat and grovel. Make Texas prostrate themselves before the “evil” Feds and beg for money . . . but then give it to them and move on. Why punish the victims for the greed of the few? As tempting as it is to want to exact your revenge on the victims in Texas for their corporate overlords’ selfish hypocrisy, why not take the high road and be the change you wish to see in the world. Remember, the system isn’t broken–they created it this way! They’ve rigged it VERY well and in the end you KNOW they’ll get the money ANYWAY. You might as well stay above the fray and not lower yourself to their level. Remember, an eye for an eye makes the whole world blind. Why is it when companies are doing well they don’t what gov. Intervention and when every thing goes wrong they what gov. Help. Two big to fail or ceo’s don’t what to take the hit. Taxpayers have rights too. I’m sorry for the small town but we can’t keep paying for poor management.